For some visitors, the howls of the Fishtrap wolves may take several minutes to download. The howling sample is about 40 seconds in length. You should see the slider bar above "fill in" as the audio file downloads. As it does, or even while listening to the wolves, please take a few moments to learn more about Project HOWL by reviewing the information below. What Does Project HOWL Do? Scientific research of wolf behavior, pack structure, and territory use. I've studied wolves in captivity and the wild since 1992, including a ten year research project on the Fishtrap pack beginning in January 2001. 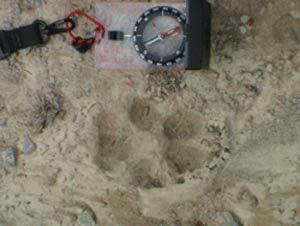 I was able to document a great deal about these animals' lives, such as their territorial boundaries, the location of their den site and multiple rendezvous sites, their travel routes, and the pack's use of their territory and the movements within it. Much of this information had been used to help avoid human-wolf conflicts, at least with local ranchers. Public education about wolf behavior, and living with the presence of wolves. This female pup from the Fishtrap pack was about three months old. She was found shot and apparently thrown into a ditch. The bullet entry and exit wounds can be seen on the side of her body. The bigotry shown toward wolves can often be intense in northwest Montana. However, I've found that over the years my presence in the woods and becoming known for my research has helped protect the Fishtrap wolves. Therefore, it has become important that Project HOWL continue in the future. 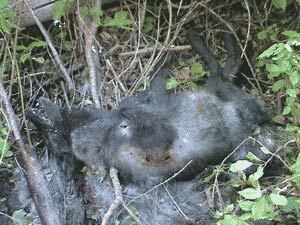 Unfortunately, politics is also an intrical part of wolf management, and in 2011 the entire Fishtrap pack was shot and killed by Montana Fish, Wildlife and Parks for apparently killing a local couple's cow. This ended the longest behavioral study of wolves in Montana's history, outside of Yellowstone National Park - a study that found wolf pack behavior never before documented. When the government placates a bigoted public, they ultimate slow down or prevent the opportunity to continue finding more appropriate solutions. This process also inhibits learning more about how wolves interact with their surrounding environment, especially in national forests where most of the wolves live. Science is only beginning to understand the powerful influence predators have throughout the ecosystems in which they live. Click here for more information. Helping to prevent and avoid human-wolf conflicts by interacting with local ranchers. Even before Project HOWL began, I worked and interacted with northwest Montana ranchers. Almost all of them have taken a neutral stance about the presence of wolves, and have been extremely supportive of my research. I work closely with several ranches to make sure conflict with wolves has been kept to a minimum. 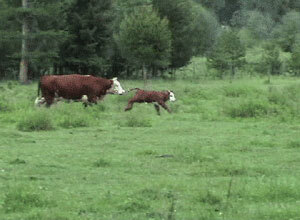 Most ranchers want to avoid conflict as much as I do, and we have become fast friends. The secret? Tell them the truth, good or bad. Honesty is greatly respected among this crowd. Now that I'm studying the wolves that have replaced the Fishtrap pack, the cycle of politics, bigotry and science continues. For current and comprehensive research results, click here.